Heaney is reminded of the last seconds of December 31st, 1999 when local blacksmith, Barney Devlin, already in his eighties, struck twelve hammer-blows on his anvil for the millennium. In an article Heaney described this moment as a ‘strike’ similar to the 9/11 ‘strike’ in that both ‘strikes, the latter a hostile act, the former celebratory, acted as ‘tuning-forks’ for poems. Heaney reveals he was not actually present in the smithy yet can celebrate the resonance of the moment: I can still hear it. Modern technology permitted Devlin’s nephew 8000 miles away in Canada to share the happening via the cellular phone held in a pose appropriate for a smithy high as a horse’s ear! Heaney recalls a line of medieval poetry that adds a spiritual’, otherworldly element to the sound: Church bels beyond the starres. Had he been there he has no Barney would have requested a poem. 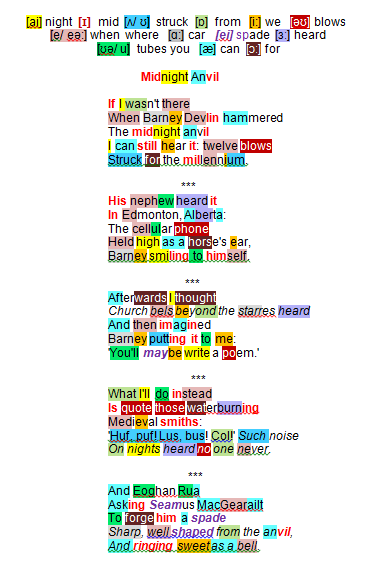 Heaney prefers a tribute to metal-workers throughout time, to those waterburning medieval smiths with onomatopoeic smithy sounds associated with the bellows (‘Huf! Puf!’) or the sibilant sound of immersed hot metal (‘Lus, bus! ), even a diminutive Nicholas (Col!) – above all the impressive clangour that was produced: Such noise/ On nights heard no one never. In the final lines, quoted from Poet to Blacksmith, he returns to the ultimate proof of metal-worked perfection – pure, uncracked sound – ringing sweet as a bell.